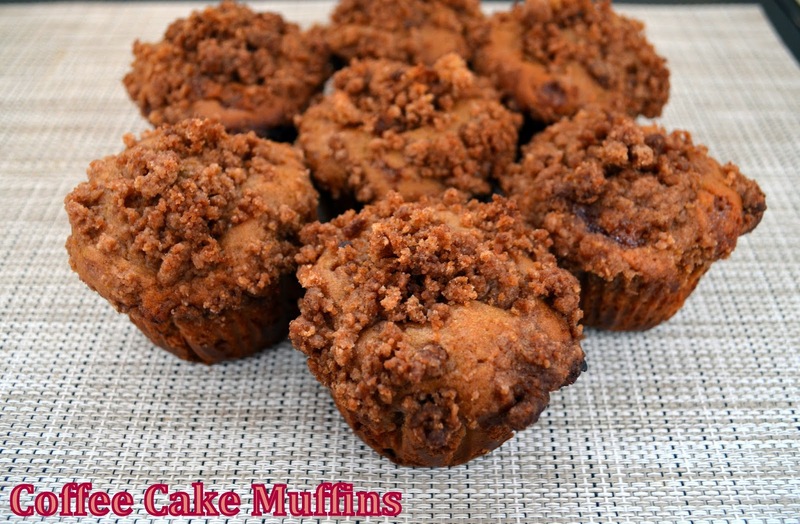 These may look like ordinary coffee cake muffins but don't let them fool you, these are special coffee cake muffins!! You'd never know from looking at them but they have a surprise inside because they are filled with Strawberry Preserves!! If you are looking for a Mother's Day breakfast or brunch idea that the kids can help with or that is quick and easy these muffins are for you. If you're not a fan of Strawberry preserves you can pick whatever flavor preserves you'd like. In our family we have lots of moms to celebrate on Sunday since Owen has 3 Great-Grandmas & 2 Grandmas but it will also be special because my sister Kelly will be celebrating her 1st Mother's Day. Usually we make a big Mother's Day brunch for our whole family to enjoy but we decided this year to give ourselves a break and go out to a restaurant instead. We hope all of you have a great Mother's Day celebrating with the ones you love. Start by lining a muffin tin with cupcake wrappers and preheat the oven to 400 F. In a large bowl whisk together all the muffin dry ingredients until combined (flour, brown sugar, salt, baking powder, baking soda and cinnamon), set aside. In a medium sized bowl combine the wet ingredients (oil, vanilla and egg). Add the mixed wet ingredients into the bowl with the dry ingredients. Using a spatula or wooden spoon mix the batter until just combined. Using an ice cream scooper place a half scoop of batter into the bottom of each liner. Spoon a heaping Tsp of preserves into each liner on top of the batter. You can choose any flavor of preserve you'd like but I'd stay away from jams or jellies since they are thinner. Scoop the remaining batter on top of the preserves to conceal them within the muffin. Each muffin liner should be about 3/4's full leaving room for the coffee cake topping. Now it's time to make the traditional coffee cake topping by combining the flour, sugar and cinnamon with cold butter or margarine. I don't have a pastry cutter but don't worry the back of a fork works just a well. Do not use your hands though cause the warmth will melt the butter and you won't get what you are looking for. Cut the butter into the dry ingredients until it breaks apart and forms coarse crumbles. Top each muffin with the coffee cake topping. I doubled the original recipes topping ingredients and omitted the walnuts she used but if you like coffee cake topping as much as I do I'd make even more of it cause I felt like there wasn't enough for each muffin. Bake 16-18 minutes. Cool for a few minutes in the tin and then allow them to completely cool on a baking rack. These sound so good! I shared them on my FB page https://www.facebook.com/mostlyfoodandcrafts?ref=hl thanks so much for linking up to the Friday Frenzy! So delicious! Thanks for linking up with What's Cookin' Wednesday!